In the first walk-through using QGIS v. 2.0.1, we loaded the US Census Bureau’s Tiger/Line Shapefiles for all counties in the US as a vector layer. We then filtered the layer to show the state of Vermont. However, all counties in the US are still there. If we go back to the Query Builder and clear the STATEFP = 50 query, the vector layer will return, showing the counties for the entire United States. Assuming we want to work with all of the counties in the United States, this is great. However, my focus is a single state. 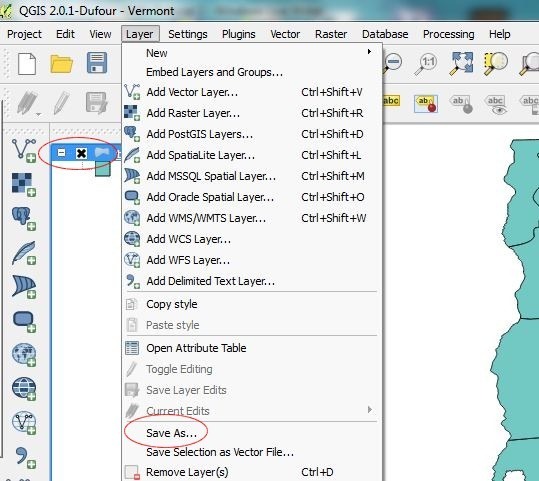 It is easier to carve out a single state shapefile, save file size space, computer memory and avoid having to deal with multiple queries later in the project. The Save vector layer as dialog box will appear. 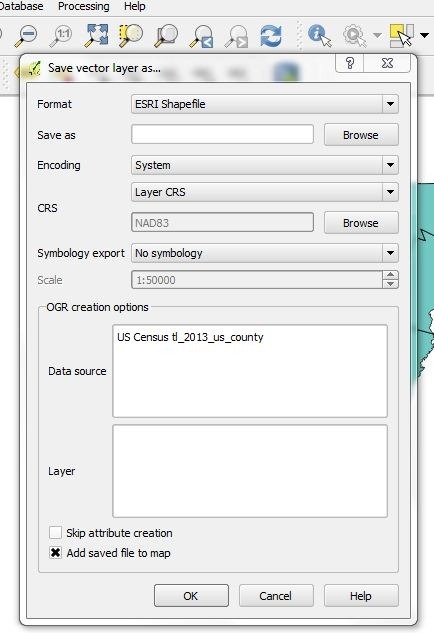 Hopefully, ESRI Shapefile is selected as the Format. If not, click on the drop down box and select this option. Note the entry I typed into the Data Source box. Documenting the source of the original data might prove useful when I need to re-work my map a year or so from now. Also, click the check box for Add saved file to map. Once satisfied with the settings, click on the OK button. A typical Windows save dialog will launch. 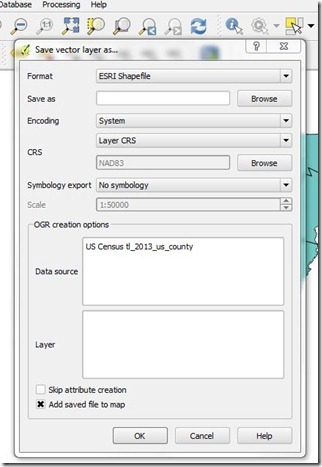 Navigate to where you want to save the new shapefile and save it. I am still looking for a way to set a default save or working directory in QGIS…without success. So far in my experience, QGIS does not always go back to the last used location. If you know how to set a default working directory within QGIS, please share in the comments. Notice the the check box for the tl_2013_us_county is selected. Click on the x and turn this layer off. We could just remove the entire US counties layer by clicking on the layer name and then using the Layer | Remove Layers (or, control-d, or by right-clicking on the layer name), but this layer might prove useful later. Turn it off for now. 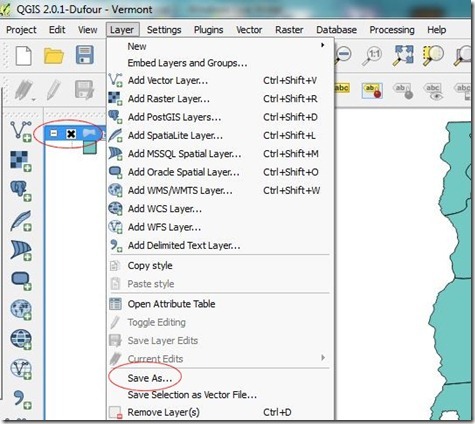 Outside of QGIS, navigate to the saved location via Windows Explorer and take a look a the file size. The new shapefile is much smaller than the original . Please share in the comments any thoughts, correction, tips or tricks relating to this walk-through.